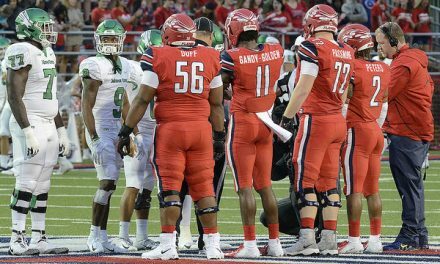 Fresh off last weekend’s visit that saw 9 prospects visit campus, the Flames picked up a commitment from a 3-star JUCO defensive tackle in William Green Jr. Others on an official visit last week included signee Brayden Monday, Marvae Myers-Glover, Clarence Hicks, Carson Williams, Reed Buys, Zach Edwards, and Marcus Harris. Myers-Glover will be taking an official visit to Louisville this weekend, the likely front runner for the defensive back prospect from Orlando. Hicks is a JUCO defensive end from Pensacola, Florida. Akron and East Carolina are the biggest challengers to the Flames for his talents. Following his visit to Liberty, there are no other known visits for him at this time. 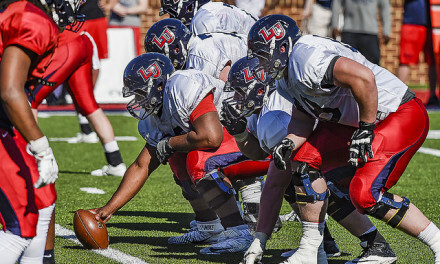 Williams, a 6’4″ offensive guard from Mississippi, has Liberty as his clear leader right now. He is on an official visit this weekend to Indiana, but the Flames have a good shot with him. Buys visited Northwest Mississippi Community College on the 22nd and also had a visit at his school from Indiana’s offensive line coach. I think Liberty has a great chance to close the deal on him. Edwards is a 3-star LB from Starkville, Mississippi. He has visits scheduled for Louisville and Ole Miss the next two weeks. Without securing a verbal from him while on campus, it’s hard to imagine the Flames will be able to lock him down as he’s prepared to visit an ACC and SEC school. Harris is a 3-star DE who has also visited South Alabama, Southern Miss, and Tulane. Just this week he picked up offers from Akron, Kansas, Troy, and Washington State. Similar situation to Edwards, we will have to watch and see where he takes his final official visit over the next week or so. This weekend, so far we have been able to confirm that Maisen Knight will be visiting campus. Knight is a 6’5″, 300 pound offensive tackle who visited Liberty in December ahead of the early signing period. He’s currently at Ventura College and is originally from Salt Lake City, Utah. He went to Ventura immediately following high school, after just one season he picked up numerous offers, committed to Arizona. He attended there for 2017, redshirted, and transferred back to Ventura for the 2018 season. He’s a 3-star prospect and has 2 years of eligibility remaining. Other names that we had been watching that are now off the table include Angel Matute, who committed to Missouri, and Samuel Okuayinonu. Okuayinonu is visiting Memphis this weekend, his final visit he will be taking. He never made his way to Lynchburg. USF is also heavily involved with him. Dorian Hewitt decommitted from Syracuse shortly after picking up an offer from Liberty, but he appears to be focusing on the Orange, Washington, and Utah. We’re still keeping tabs on Ryan Nixon and Jeremiah Houston, but the closer we get to signing day with no news from them the less likely it is they will be signing with the Flames. Nixon visited campus in December, but never committed. It doesn’t appear he has any other strong candidates though. 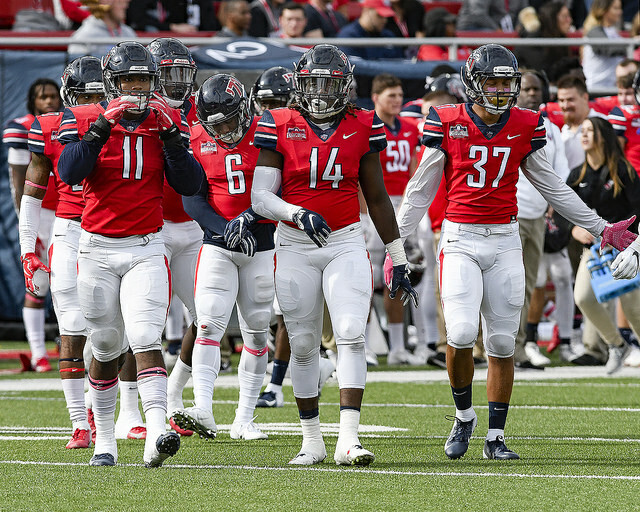 Houston verballed to Liberty prior to the coaching change, and after being courted by other schools it sounds as though both Liberty and Houston have moved in different directions. Christian Harris is a 3-star defensive end that was offered under Coach Gill’s staff, but now the new staff has heated up their pursuit by offering him this week. He is scheduled to visit Lafayette this weekend, and has also visited Western Carolina and Army previously. If Liberty makes him a priority, we should be able to snag him. A grad transfer from South Alabama has popped onto our radars as well, as Ryan Alexander recently got offered by the Flames. He has just one year of eligibility left and has offers from Rutgers, Syracuse, SMU, Charlotte, and Tulane. We will have to see if he makes a visit to campus. His recruitment will likely stretch beyond signing day. Jonathan Boyd is another 3-star offensive lineman that the Flames are pursuing. He’s a 6’6″, 280 pound prospect from Sacramento where he attends Capital Christian. Boyd is scheduled to visit campus next weekend. He’s at Indiana this weekend and has named a top 4 of Liberty, Indiana, Princeton, Yale, and Harvard. Coach Freeze has stressed the importance of being able to have a full year to recruit a class, and that has been evident as his staff has been offering 2020 and 2021 kids every day. We’ve tracked over 20 offers for 2020 prospects and a handful for 2021.